Clever, crafty creative Cintia (from the My Poppet blog and My Poppet by Mail online shop) shares with us her two-year-old daughter Emma's fun bedroom. 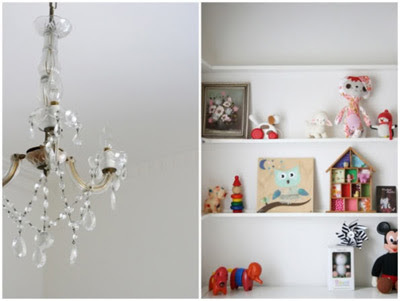 You can't go wrong using a netural base with lots of colourful accessories and Cintia does this so well, bringing together vintage and modern in her daughter's special space. 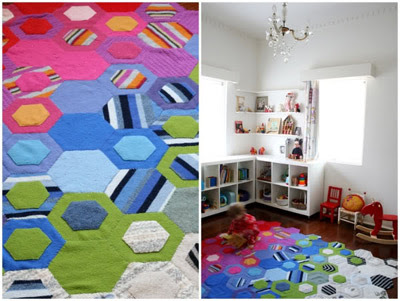 My favourite (and Cintia's favourite) element of the room is the beyond-divine hexagon rug made by Cintia using recycled sweaters and old blankets. I told you she was clever. Lots of great DIY ideas here. Enjoy! Rug: I made the rug by hand from thrifted jumpers and blankets (see the work-in-progress here). Wardrobe: Refurbished hand-me-down (tutorial here). Tree painting: By my sister (more details here). Doll's pram: Vintage from Rotary's Camberwell Sunday Market, VIC. Emma Heart: Made by Jenni. Floor Cushions: I made these using IKEA fabric (see tutorial here). Fabric decals on wardrobe: I made myself with fabric scraps (see tutorial here). Little chairs & Lion cushion: thrifted. Chandelier: we were lucky that the chandelier came with the house. Owl artwork: Look at the Wall. Bunny Chi: One Red Robin. Wooden house display shelf: Vintage, $2 from the Op Shop. I added some fabric and paint chips to the windows to create a colourful wallpaper effect. Artwork: Madeleine Stamer - Little Circus Design. 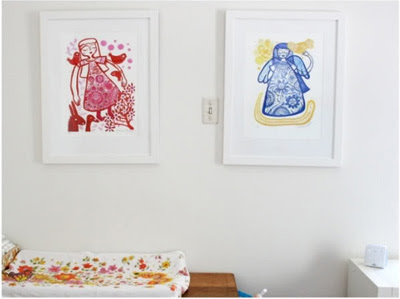 Cot bed linen: I made it from vintage sheets. Cot quilt: I made it from vintage sheet remnants. Bird mobile: I made using a pattern by Laura on Spool. 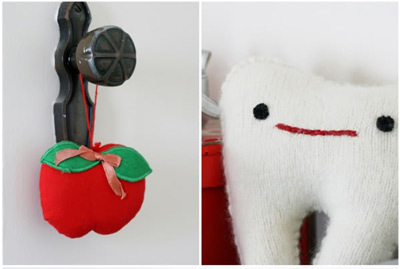 Red apple hanging decoration: Vintage christmas decoration from the Op-shop. 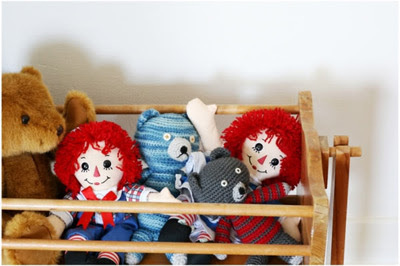 Crochet teddies: made by me. 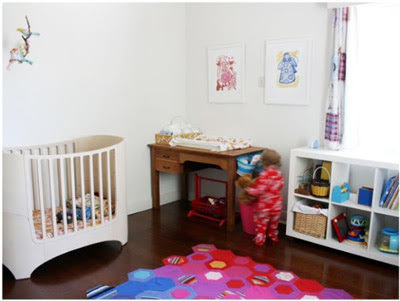 Thank you so much Cintia for sharing your daughter's amazing space. 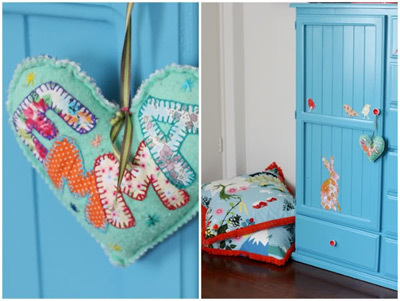 If you love Cintia's style, head over to her My Poppet blog where you will find lots of great crafty tutorials and handmade inspiration. 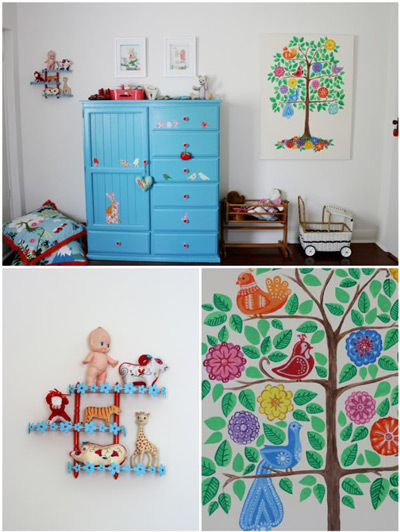 For more great Australian Kids Room ideas, check out the Kids Room category here on Bondville. Wow! That makes me inspired yet craft-inadequate. That rig is amazing! So colourful! 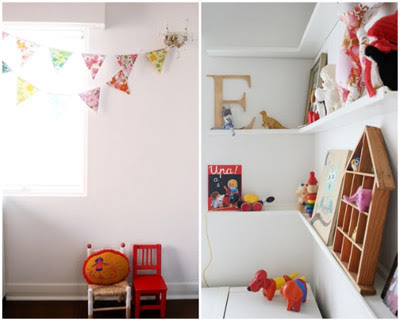 I'm loving children's rooms right now. Still working on Rowan's and can't wait to blog it when finished. What a beautiful room! I love all the unique features! 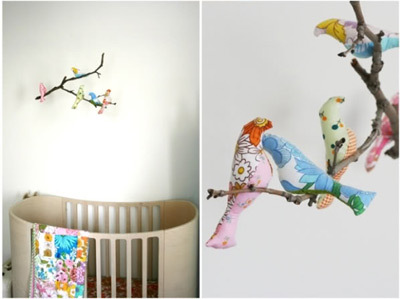 I have used the Spool pattern for a mobile too... very simple but oh so cute! :) Lovely - will pop over and visit My Poppet now!